Is that something we should be considering for the future? Will the idea of advertising campaigns disappear? Perhaps our vision of the right message to the right person at the right time means that brands need to be constantly in-market. How else can the be assured of being at the right time? Our spin doctor is still in the house so, lest somebody say something about this being a good day to bury news, let’s start with the biggest news. Google’s reported fourth-quarter profit surged 29% to $2.54 billion. Yikes, that’s a lot of money. Somewhat overshadowed by news late on Thursday evening that Larry Page, Google’s co-founder, is taking over the reins from long-time chief Eric Schmidt. I wonder if there are more changes afoot? So, that’s an opening totally fitting with last week’s four pillars of digital advertising news which bodes well for the rest of this week’s review, doesn’t it? Having started with Spend Watch, why not continue in that mode. As they say in television, cue titles ..
I’ve not done a Facebook revenue prediction this year. It seems like everybody has one on a reasonably regular basis so why not me? Thus, deep breath, Facebook is expected to make over £2.5 billion ($4 billion) from advertising in 2011, it has been estimated by eMarketer and reported on by the IAB. Compare that to the numbers reported in Advertising Age that the social network took in $1.86 billion in worldwide advertising revenue for 2010 (which was still a 151% increase over the company’s estimated 2009 advertising revenue). Pretty impressive numbers, although, of course, somebody had to find the flaw. Those numbers were “not as impressive as Google’s growth in its pre-IPO days” according to SFGate. Elsewhere, ad-spending hit a record high in Malaysia; social gaming to top $1 billion in 2011 and advertising is expected to make up for 20% of game developers’ revenues next year, according to another eMarketer report (quoted by Coast Digital) and a Winterberry Group report at MarketingProfs says, “Within digital, social media ad spend is expected to increase more than 35%”. A healthy growth report from our spin doctor then. China has achieved double digit internet growth rate since 2006 and currently housed 420 million Internet users. There are also 755 million mobile subscribers in China, making it the world’s largest mobile market. Such a big market for advertisers. And, I don’t often quote data from an advertiser’s perspective but last week I saw that Cadbury’s had reported between £2 and £3 in sales for every £1 it spent on internet advertising – which seems like some more pretty decent numbers to me, spin doctor or not. Crossing the line from Spend Watch to Video we read, via RapidTV, that in France, video advertising passed from €12 million to €30 million in turnover over one year. While back in the UK, the IAB released new 2011 best practice guidelines for video and called for a “mature” approach to video ads. As the money flows into online video advertising we’re seeing the technology around the delivery gain traction. This week, for example, Rocket Fuel Inc. announced Video Booster which, apparently, allows “brands to engage audiences and reach campaign objectives with unparalleled precision and efficiency”. 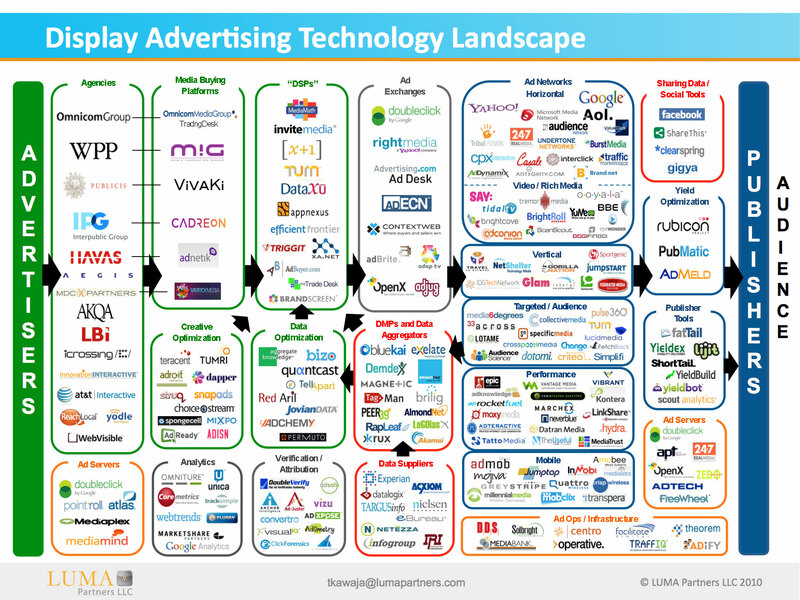 How long before bidding on video ads becomes mainstream? Kendall Allen at Advertising Age wrote this week that “Our industry is ecstatic over bidded media” and questioning if it’s quite as big as we think. I had believed that a lot of the real-time buzz was from the buy-side of the business but Kendall notes buyers are, “still waiting for this holy grail of audience intelligence at scale”. Perhaps helping us get a little nearer audiences at scale, Adobe announced the inquisitional of leading data management platform, Demdex. [it’s not necessary] to obtain consent for each individual operation of gaining access to or storing of information on a user’s terminal, if the initial information and consent covered such further use. Elsewhere, Better Advertising (sorry, Evidon) are working with Collective (they call themselves “the leader in understanding and delivering audiences”) “to power ad notice for more than 28 premium publishers and advertising networks” using Collective’s media management platform. More notice should be a good thing, right? Friday saw my Twitter feed tell me that The Wall Street Journal’s opinion page comes out against US “Do Not Track” proposals. Of course they were the news organisation to highlight some of the issues around online ad tracking so it would be fascinating to read what they say in an opinion piece. It’s behind a pay-wall so if you have a subscription read it (http://on.wsj.com/fU6qbW) and let me know in the comments. Now, away from my pillars what else did we learn last week? For starters, “Almost a quarter of Irish consumers are “strongly negative” towards online advertising” [Belfast Telegraph]; TGI’s James McCombe noted that, from a marketing point of view, mobile Twitterers are an attractive target in their own right [MediaTel]; Bonnier announced that it was developing next-generation ad formats for tablet magazines in a move said to “addresses a fundamental need in the industry: all-new advertising for all-new advertising platforms” [SFGate] and, back to where we started with news from Google, and Mashable’s exclusive report that the search giant is preparing to launch Google Offers – a Groupon-style daily deals offering. Interesting to me as I was going to add ‘Coupons’ or deals to our four digital advertising news pillars but wondered if they would/could sustain the hype for a year. Well, let’s see if they make any news next week when I’ll kick myself for not putting them up there. At the starting blocks of 2011 and I can already see the trends emerging for the topics that will be the mainstay of Last Week In Digital Advertising for the next twelve months. Should I just give up now? Regardless, here we go for the first view of the new year and, periodically, I’ll check-in with this list to see if we’re talking about other things. At the starting blocks of 2011 and I can already see the trends emerging for the topics that will be the mainstay of Last Week In Digital Advertising for the next twelve months. Should I just give up now? Regardless, here we go for the first view of the new year and, periodically, I’ll check-in with this list to see if we’re talking about other things. And yes, I am well aware that this isn’t dissimilar in concept to my already published 2011 Digital Advertising Predictions but it is based on what the recent buzz has been and continues with my idea of a news review. I think the bigger issue is that people want control. They want control over their experiences. And so I agree. I think there are people, lots of people, who will give up data about themselves willingly in return for something. And control seems to be a key theme of the privacy story this week. eMarketer quotes a survey by PreferenceCentral which found that “the more people know about behavioral targeting, the less willing they are to receive free content in exchange for relevant ads” but principal analyst David Hallerman wonders if, “people really view behavioral targeting as an invasion of privacy, or do they dislike it because they have no control over how marketers are using their personal data?” Publishers, unlike most marketers, have first party relationships with consumers and, Jonathan Mendez argues, there is an implicit understanding that this data is going to be used to make the user’s experience better. That’s a good position for publishers as long as the data is treated with care. Kevin Lee at ClickZ writes under the headline “If Tracking Is Outlawed, Only Outlaws Will Have Tracking” and suggests that ads should have more space devoted to explaining what data the ad used in the hope that consumers will “leave well enough alone and prefer targeted ads to untargeted ads”. Of course we have an embryonic system to show such information in the form of the Better Advertising initiatives who, this week, became Evidon. The name chosen to “evoke a connection with the word â€œevident,â€ which expresses our commitment to bringing clarity to the online community”. Their blog has more. Clear? Well, Mozilla’s aiming to making it all clearer with their alpha release of privacy icons which they are proposing are adopted to let users know how data is used. I like the idea. Interesting to see The Wall Street Journal run a piece on how Google is trying to square using all their data with the privacy implications of that use. An interesting piece but amusing to see an article on privacy based on a leaked, internal, confidential document. Not sure I see the public interest value in raising privacy flags on a bunch of ideas that aren’t products but, nonetheless, interesting reading. Video is at a crucial turning point, so says Jill Druschke in AdWeek and I suspect we’re right. It is one of the things to watch on my Horoscope for 2011. And, while I think cross-media comparison of ad-spend has some holes and should be read with caution, it is worth noting that online video represents only 7% of the entire ad market. Things are moving, though. New Media Age reported that “video ad network WebTV Enterprise saw ad revenues triple last year” with a 244% rise in video ad revenue in 2010 compared to the previous year and seems be a decent indicator for that sector of the ad business. MediaTel noted that worldwide PVR sales are expected to hit the 50 million mark in 2014 but will, eventually, be overtaken by internet-enabled television sets. Around 350 million connected TVs are expected to be sold worldwide by 2015, according to Parks Associates (source: MediaTel). Adding a note of caution into the discussion, however, news that a new content distribution network built by BT will ensure greater bandwidth for users wanting to watch online video without disruption, even during peak online usage times (source: MediaTel). If such initiatives lead to a 2-tier web will consumers pay for it or head straight back to broadcast? An interesting one to watch. Another note of caution was injected into the video discussion by Netimpreative, who note that “Online video rentals â€˜failed to live up to hypeâ€™ in 2010” quoting Screen Digest’s figures that, in the US, network-delivered rentals and sales via the Internet and subscription TV systems accounted for $2.3 billion, representing 12.2% of the total market. At this stage, is 12% that bad? We’re moving to a more automated world, that’s for sure. How far we go is still to be seen but publishers everywhere are being encouraged to look at real-time trading systems. Eric Picard’s “Why publishers are afraid of real-time bidding” has some interesting things to say about data leakage and pricing while Jonathan Mendez suggests that real-time systems can make data pricing “more automated and more intelligent” (yes, second quote but it’s a good piece). We can’t resist any little change in the revenue forecast numbers and I know I’ll be quoting lots of articles that predict even tiny changes in spend throughout the year. This last week or so we had a nice crop. New Media Age ran with “Display overtakes search in 2011 ad spend growth predictions” Advertising Age ran with “Local Advertisers Finally Join Ad Recovery” as in the third quarter of 2010, smaller US advertisers increased spending 8.1%, compared with a 9.1% hike in the top 1,000. The Economist told us that global spending on advertising will grow by 4.5% in 2011, led by online advertising which will increase by 16%. In the land of mobile game advertising, Juniper Research discovered marketers spent $87 million worldwide advertising on mobile games in 2010. By 2015, the amount will be 10 times greater, at nearly $900 million (quoted at Miki Devic’s posterous blog). And talking mobile, I was surprised to see that only 12% of the UK population have mobile internet access, according to The British Population Survey and quoted by Netimperative. Those will be four of the big news sectors I’ll be following in the coming weeks but what else did we learn this week? The Internet is now the main national and international news source for people ages 18 to 29 in the US says Pew Research (quoted at Mashable); SNL Kagan told us the number of location-based services users nearly tripled in 2010, reaching 33.2 million (via eMarketer); Internet Retailer reported that this Christmas shopping-related Google searches from mobile devices are up 230% and, of course, we heard again and again about the unstoppable rise of Facebook. I’m already watching to see if any of these trends make next week’s news.